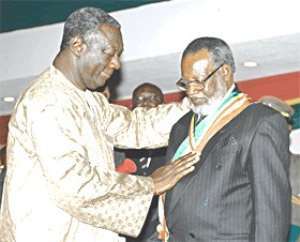 Accra, June 25, GNA - Ghana on Friday honoured the Namibian President Dr Sam Nujoma with the highest national award of the Companion of the Order of the Star of Ghana. President John Agyekum Kufuor decorated President Nujoma who is on a three-day State visit to the country with the sash. Nana Addo Dankwa Akufo-Addo, Minister of Foreign Affairs, read the citation at a State banquet held in honour of the visiting Namimbia president. The citation read: " You are being honoured for your dedicated and selfless devotion to duty to the people of Namibia and your role to set Africa on the path of peace and sustainable development". "It is your avowed aim to liberate your country and Africa and in recognition of your untiring leadership role, contribution to Africa's liberation, peace and stability and your role to deepen the bond of friendship between Ghana and Namibia". President Kufuor proposing the toast said " I have no doubt at all that the relationship between our nations would grow further in the years to come as we continue to work closely at bilateral and multilateral levels". He observed that under the leadership of President Nujoma, Namibia had played an invaluable role towards the stabilization of the Southern part of the African Continent and in the process had committed substantial resources of Namibia towards Africa's peace efforts. President Kufuor said "Ghana is really very proud of the solid and able leadership that you have provided both within Namibia and on the Continent of Africa". President Nujoma who was overwhelmed by the honour in responding to the toast said, " I am deeply moved by the honour bestowed on me". He said Ghana had been a shinning star to the Governments and people of the Southern parts of Africa and they drew great inspiration from Ghana when the country attained Independence on March 6, 1957 to liberate their people from colonial rule. President Nujoma said the visit was an opportunity for both countries to expand and strengthen the bond of friendship and co-operation between their Governments and the peoples. He stressed the need for co-operation in the fields of education, health, science and technology, tourism and cultural exchanges between both countries for their mutual benefit and development. President Nujoma appealed to African leaders to ensure that the vast natural resources on the Continent were utilized for the benefit of Africans. He commended Ghana for her role in maintaining peace in Liberia, Sierra Leone and Cote D'Ivoire and the sterling leadership of President Kufuor as Chairman of the ECOWAS that had ensured peace and stability within the Sub-Region. President Nujoma first visited Ghana in April 1960 to attend the All African Peoples' Conference that was organized by Ghana's First President Osagyefo Dr Kwame Nkrumah for African leaders.